Let me back up and explain how I got there. First, if you are new to this blog, scroll on over to the right and read the disclaimer that this is my blog and not representative of my employer. Next, realize that I am walking a delicate line, so I can’t post pics of dead hogs and have to use my words wisely. Finally, if you are unaware of the damage this non-native species does to the ecosystem, read here. http://www.nps.gov/grsm/naturescience/dff309-meetexotic.htm Got it? Great, let’s move on. So why am I trying to shoot a wild beast in the middle of a National Park, in the middle of the night? Well that’s my job. Last December, after spending one too many hours behind the wheel of my patrol truck, I quit my career as a Law Enforcement Ranger and switched back to hunting hogs for the Smokies, a job I had previously held for seven years prior to my LEO job. Some people think I am crazy giving up “permanent” status and taking a huge pay cut, but I think it is crazier to work a job that you don’t enjoy anymore. I have hiked up to Gregory Bald to spend the week hunting hogs. Since my season is coming to an end, I thought I would write about a typical week on the “mountain”. Spring changes everything. The hogs I have been hunting and trapping all winter have moved up to higher elevation to feed on the abundant spring beauties. When the hogs move up, so do I, and I have been camping Monday through Friday since mid-April. The winter cold is replaced by rain, fog, bears, and bugs, bringing their own set of environmental challenges. Our division has a series of camps strung out along the Appalachian Trail, so I pick a camp, pack in my gear on Monday and hunt until Friday. The following is an account of what life “on the mountain” is like, at least my life and my camp. The events and pictures are from a week in May, with the exception of a few pics because my phone died and I snapped those during the next. Time is ticking away. My shift starts at 1600 and since my wife is visiting family in Florida, I have to get the chickens squared away before I head out. Usually free-ranged, being confined to their run for the week is going to make them real bitchy on Friday, so I let them out while I plant three beds of corn and water the garden. Our camps have sleeping bags, tents, and a few other items locked in gang boxes, so all I have to take is my food, books to read, my gun, and ammo. I already went grocery shopping over the weekend and pack my food bag with oatmeal, dried fruit, almond milk, clif bars, almonds, llama jerky, coscous and some dried pineapple. Eating only two meals a day when I am camping simplifies my menu. I pack a book on herbal medicine, a book on raising chickens, a wildflower field guide, and the small book I sketch and document plants. It snowed on me at the end of April, so I throw my primaloft jacket, a pair of socks, a pair of underwear, a merino t-shirt, my rain gear, and a fleece hat into the Wild Things Andinista pack that I am testing out. 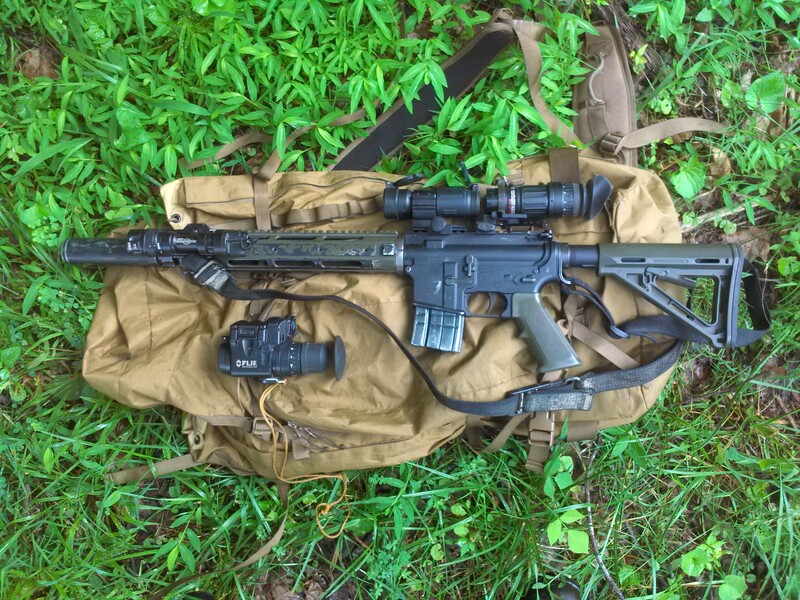 This week I take my AR chambered in 6.8 SPC, PVS-14 NVG, and a thermal monocular. I usually take my Remington 870 when the mountain “greens up”, but I have a Surefire IR/White light on loan that I want to run with the night vision. My week begins with death as I pull up to a motorcycle fatality at the beginning of the Dragon’s Tail. I watch as they photograph the body and load it onto the ambulance. Six months ago, as a LE Ranger, I would have been out assisting the medics and deputies, but now I gratefully slide by as they wave me through. I imagine that his family would be consoled by the fact that he was doing something he loved, but it is a good reminder of the fragility of life for me as I continue my commute. I park at the trailhead and my five mile hike in is uneventful. Lots of hog sign on top of the ridge and I head to camp to set up. 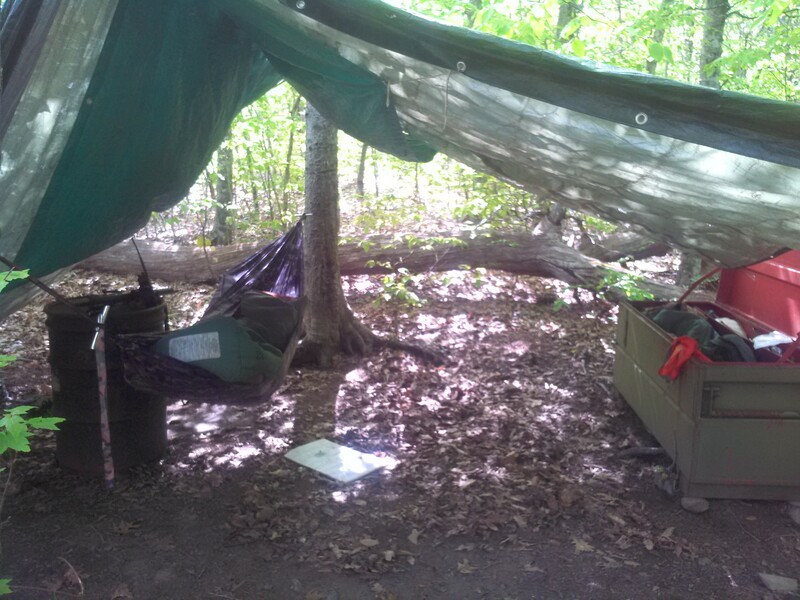 When I first came up in April, I set up the raggedy tarp and hung another one under to stop the leaks. The gang box holds a tent, sleeping bags, ground pads, a stove, and a few other things. It doubles as a bear box when I leave camp to hunt, so I can store my food and gear without them tearing it up. My setup is really just wrapping my tree straps around the two trees so when I get back in the middle of the night, I can just hook my hammock to them. The 55 gallon drums are relics from pre-gangbox days and we store the tarps in them at the end of the season. I ate a big lunch, so I just snack on a clif bar and some almonds. I lock up my food and books, and head out to hunt. If you are unaware of the damage hogs can do, this picture says it all. The whole top of the ridge is plowed under as they seek out the tasty tubers of spring beauties. I don’t blame them as they are delicious sauteed and pretty good raw. Like four-legged rototillers, the hogs disturb acres of serene mountain tops. It is windy all afternoon and through the night with steady gusts at 10 – 15 mph. Years ago, I would have call it a wash as your best sense for night hunting, your hearing, is disarmed. Technology has caught up with the hog boys though and a thermal monocular allows me to reclaim the night even more effectively than night vision (NVG). I spend my evening walking the trails peering through the monocular, looking for the telltale white bodies of the hogs. Around 2300, I slip up on a sow and three shoats and wait for an opportunity. Becoming sexually mature at six months means even these juveniles are on my hit list. Thermal allows you to see the animal’s body heat clearly, but if it is not mounted on your weapon you have to use white light or night vision to take the shot. When I look through the night vision mounted behind my Aimpoint, all I see is brush. The shoats safely root underneath the thick blueberry bushes as I lie in wait just yards away. Eventually they join the sow and wander off the side out of view. I move on, repeating the same frustrating game with a boar closer to camp. 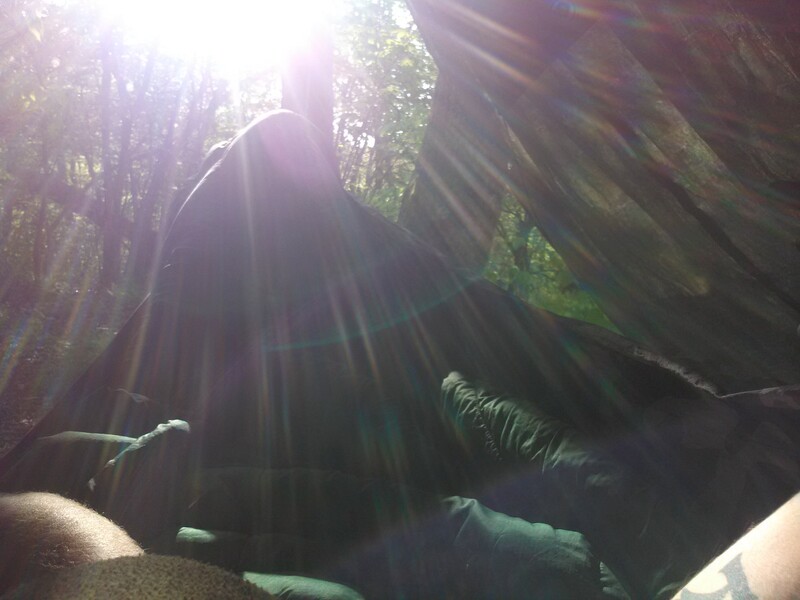 At 0100 I return to camp, set up my hammock, call out of service, and go to sleep. The sun wakes me up. I slide out of my hammock and fix my oatmeal with fruit. I visit the spring to water up and slip back into my hammock to laze the day away, reading books and making a few phone calls until my shift starts at 1600. I have read accounts where explorers described native populations as being lazy. If one of them rolled into my camp, they might say the same thing. Since my caloric needs are met and I will be hiking and hunting all night, I lounge around during the day and study plants, read, occasionally work out, and make to do lists for when projects back home. I turn my radio on for two hours during the day in case my boss needs to get a hold of me, but my off duty time is my own and I don’t expend a lot of calories. My boss calls me to see if I want to come off the mountain early for the seasonal employee picnic, but I decline. The afternoon rolls around and I re-hydrate some llama jerky and mix it with couscous for an early dinner. I leave camp and head towards Parsons Bald. Just before crossing Gregory a boar runs across the trail, but I don’t take the shot. It’s uphill and I can’t see what is over the rise. No hog is worth putting a bullet into a hiker and our rangemaster, “Rambo” Ricky, drilled that into our crew back in the day with his “judgement” course. A ghetto version of a FATS simulator, he would set up tents and mannequins back behind targets on a “jungle lane” shooting course. I cross the Bald and run into a big bear headed the opposite direction. He doesn’t run off, so I know he may be a problem later. Traditionally, bears have learned to follow us on the trails for free food. 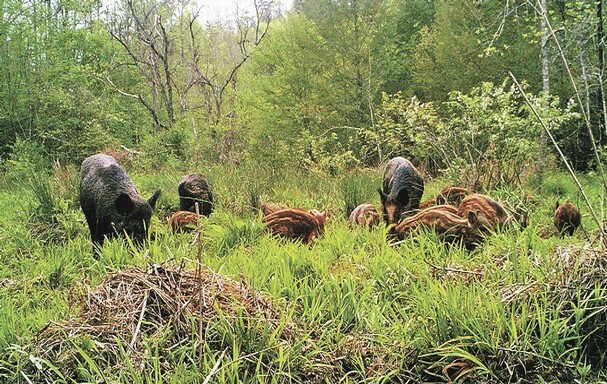 Spring is a hard time for bears, so scoring an all-you-can-eat bacon buffet is a pretty good deal. He will later harass the vegetation crew and cause the nearest campsite to be closed in June, but for now he just cruises by with indifference. I stop in at Campsite 13, introduce myself, and inform the nice couple from Wisconsin that I will be hunting in that area. We chat about bears and I give them some tips on dealing with them. Just before dark, I catch a 200 pound boar rooting in the trail. This time I have a safe shot, so I slip closer, and dispatch him with a head shot. It is about as humane as you can get and prevents tracking and trailing woes. I take my blood samples, snap a picture, and drag him off the hill. I head out to Parson’s Bald and wait until dark before hunting my way back to camp. 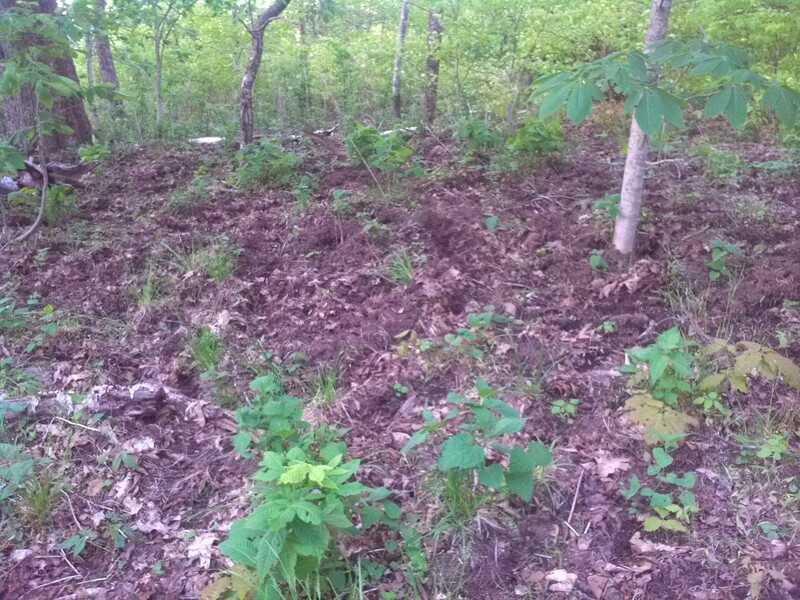 I get in at 0100, after stalking another boar only to be thwarted by the thick growth again. 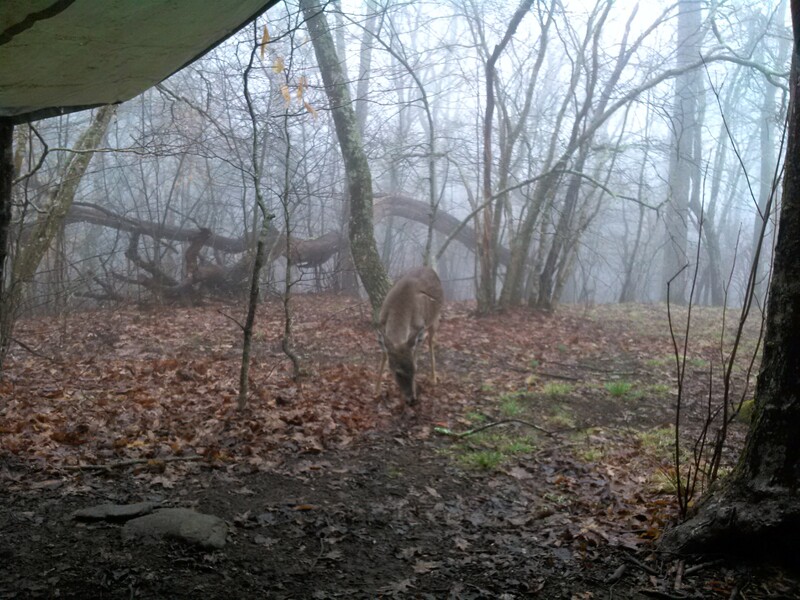 This entry was posted in Hunting and tagged 6.8 spc, Andinista, Appalachian Trail, AR, backpacking, bears, FLIR, Great Smoky Mountains, hammock, hiking, hoghunting, National Park Service, night vision, PVS-14, Remington, shotgun, Smokies, spring beauties, Surefire, thermal, Wild Things, wildlife ranger on June 18, 2014 by bigpigoutdoors. Another great read and part two sounds just as interesting, if not more. The part about …”but I think it is crazier to work a job that you don’t enjoy anymore” hits home. Glad you are back to doing what you enjoy. Have you ever caused back country campers to freak out? One of our guys got called in years ago as a “man on the trail with an assault rifle”, so I make it a point to talk to each hiker I run into or just slip off into the woods if I am not in a talking mood. I remember when I was hiking on the AT somewhere in the Smokies. I got a late start and as I was walking out of the shelter, I ranger with a rifle and big light came walking up. That was my first encounter with boar hunting Rangers. Looking forward to pt 2. Thanks Roger. Maybe I will run into you up there sometime.